Emuge EF-Micro coolant fed carbide drills are part of the EF-Series of high penetration rate drill series. 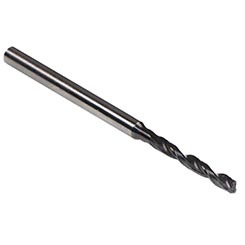 These sub-micro grain carbide drills can replace conventional cobalt style drills and start at 0.75 mm (0.0295”) up to 3.0 mm (0.1181”) diameter and are a coolant through design. EF-Micro drills are high performance drills that are used extensively in the medical, aerospace and precision machining industries. These high precision drills provide longer and repeatable tool life and eliminate the need for peck-drilling while providing precise finished hole location values. Designed for CNC drilling applications with fine filtration units.